The Federal Point Historic Preservation Society will hold its monthly meeting on Monday, October 17, 7:30 p.m. at the Federal Point History Center, 1121-A North Lake Park Blvd., adjacent to Carolina Beach Town Hall. This month our program will be “Remembering Hazel.” Steve Pfaff, with the National Oceanic and Atmospheric Administration, returns to give an overview and how Hazel rates in the history of North Carolina hurricanes. In addition we have Byron Moore and Charlie (Tommy) Greene, both long time members of our Society, on board to talk about their personal experiences during and after Hazel. From Wikipedia: At landfall on October 15, 1954, the hurricane brought a storm surge of over 18 feet to a large area of coastline, producing severe coastal damage; the damage was greater since the hurricane coincided with the highest lunar tide of the year. 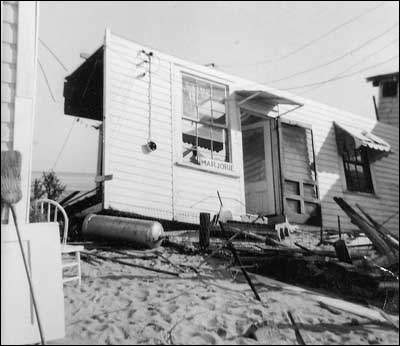 Brunswick County, North Carolina, suffered the heaviest damage, where most coastal dwellings were either destroyed or severely damaged. For example, in Long Beach, North Carolina, only five of the 357 buildings were left standing. 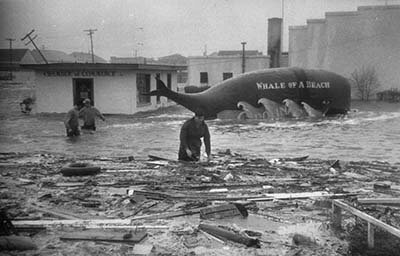 The official report from the Weather Bureau in Raleigh, North Carolina stated that as a result of Hazel, “all traces of civilization on the immediate waterfront between the state line and Cape Fear were practically annihilated.” According to NOAA, “every pier in a distance of 170 miles of coastline was demolished”. Nineteen people were killed in North Carolina, with several hundred more injured; 15,000 homes were destroyed and another 39,000 were damaged. The number of people left homeless by the storm was “uncounted thousands.” Damages in the Carolinas amounted to $163 million, with $61 million incurred by beachfront property. Total damage in the United States ranged from $281 million to $308 million. While Hazel caused the most damage in the Carolinas, the storm did not lose all of its intensity. Going north, Hazel turned extratropical by midday when it merged with a cold front; however, it retained hurricane-strength winds and it was continuing to drop heavy rainfall. 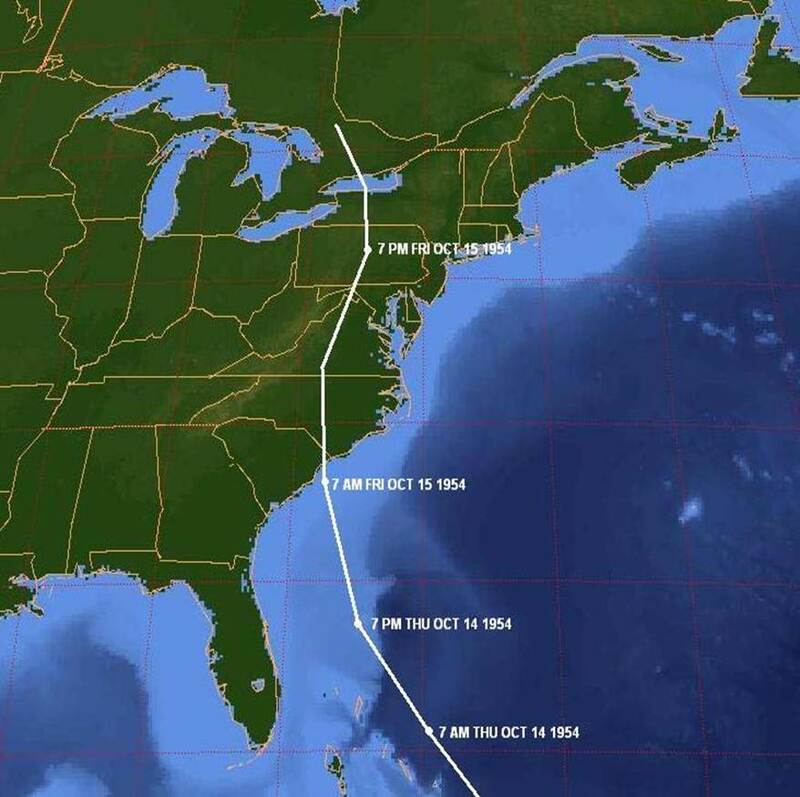 Sixty-two years ago on October 15, 1954, Hurricane Hazel slammed into our area as the only Category 4 storm to hit the Carolinas in all of the Twentieth Century or since. 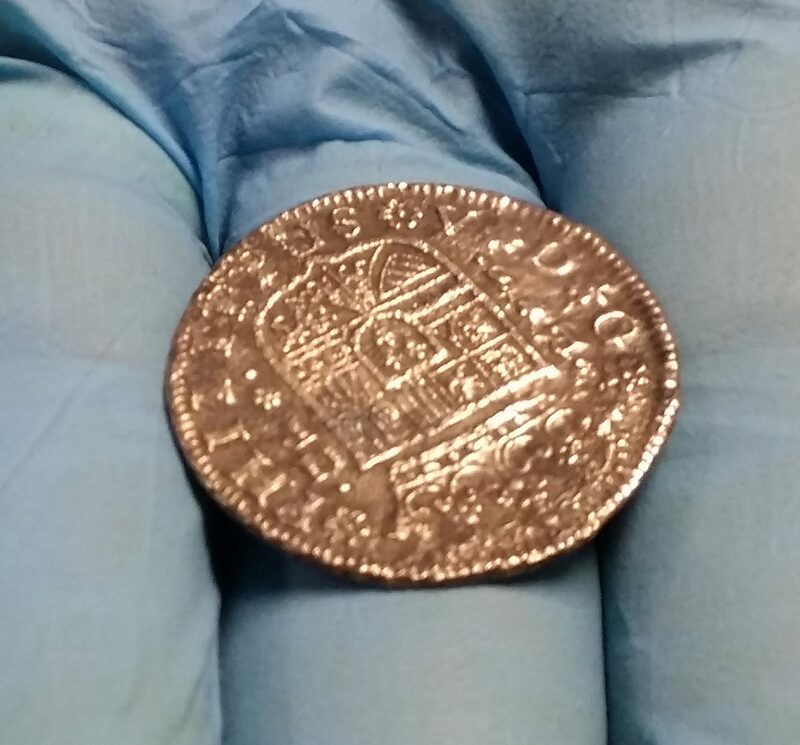 It came in on a lunar high tide which added to the flooding damage with winds at our beaches clocked at almost 100 miles an hour. It was possibly the most devastating hurricane to ever hit the NC/SC border. 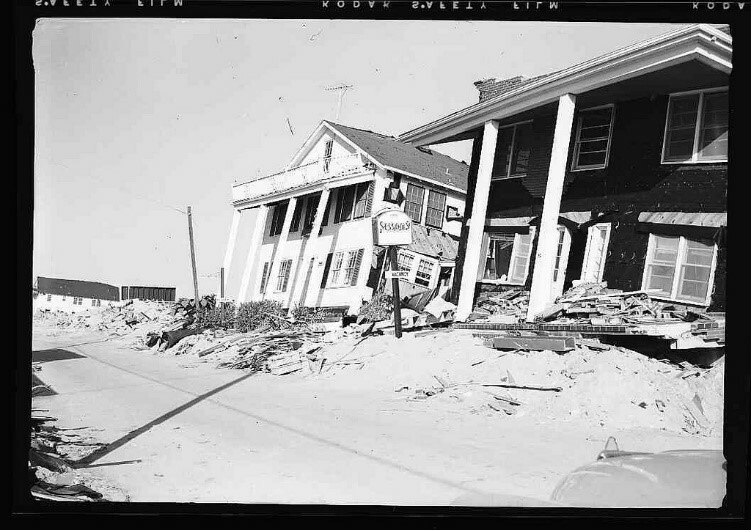 This picture shows what is now the 200 block of Carolina Beach Avenue North with the two-story Sessoms’ Rooms and Apartments (on the right) after Hazel. It was pushed over with the bricks formerly covering the exterior tumbled on the sand. This post card (below) shows what Sessoms’ looked like before Hazel. It is not postmarked, but the Ford parked next to the building is a 1952 model. So, this card could be 1952, 53 or even 54 since Hazel hit in October and the photo could have been taken earlier in that year. On the porch sit several aluminum chairs with webbing which were very popular in the fifties. You entered through a screen door with an aluminum floral design also popular mid-century. All the windows have screens to let the cool ocean breezes in. You can also see a parking meter by the curb showing that at one time Carolina Beach had meters along that stretch of Carolina Beach Avenue North. Do you think the guests parked in the sand lot cordoned off by the chain? Sessoms’, 52 Carolina Beach Avenue North, address was before the center of town was moved 2 blocks north which would put it in the present day 200 block. It was owned by Edger and Novella Sessoms who also owned another Sessoms rooms and apartment. across the street. Their niece, Carol Sessoms Ford, used to live in the white 2-story building in the Hazel picture. It was purchased by the Sessoms in the late 1950s or early 1960s and still remains at 236 Carolina Beach Avenue North, now part of Surfside Motel. 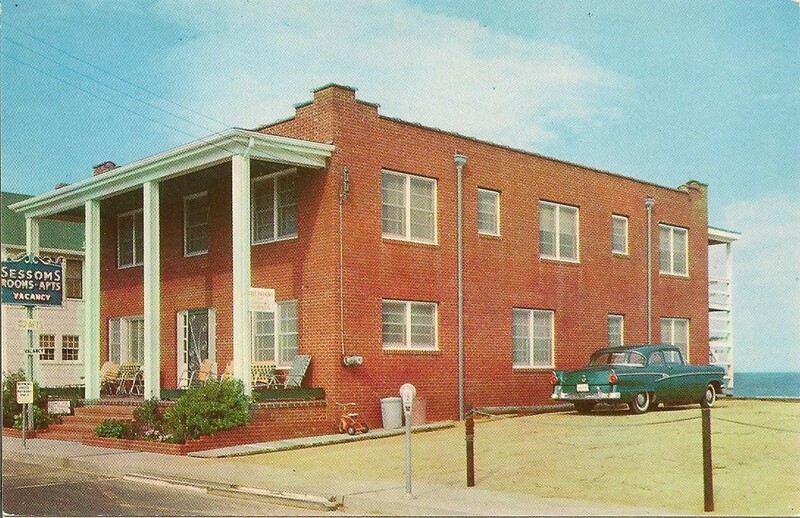 Carol stated that the Sessoms’ brick building was torn down to make room for a three-building modern motel with a pool in the center which is still there, and also, a part of Surfside. 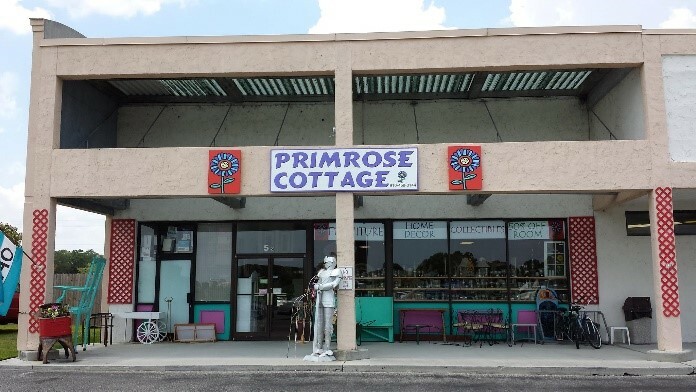 Primrose Cottage is one of the very best consignment stores in New Hanover County. We are very happy to welcome them as Business Members of The Federal Point Historic Preservation Society. Sue and Doug Walker moved to North Carolina from the Hudson River Valley in New York State in 1994. 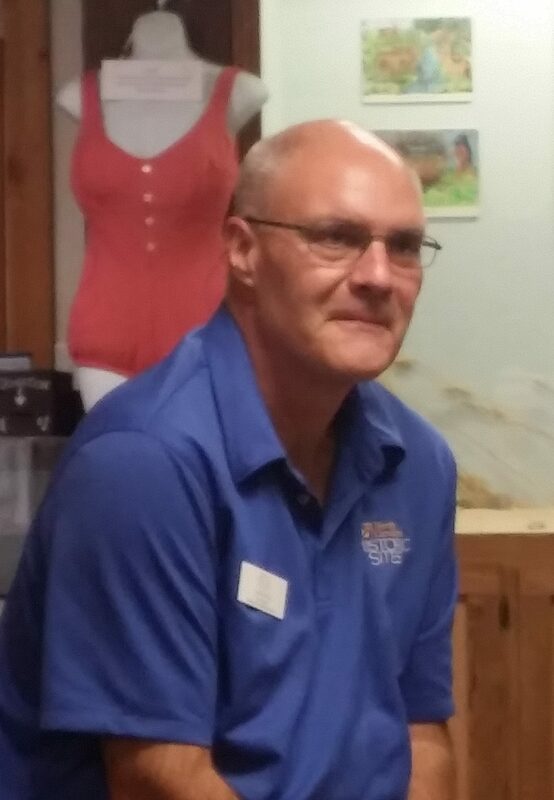 Doug remembered that Sue had once told him, “I want to be an entrepreneur.” And what a great one she has turned out to be. Sue and her daughter, Jill Lyons, opened the doors of Primrose Cottage in 2006. Primrose has a vast selection of consignment goods that are constantly changing from day to day. Nothing stays long enough to collect dust. And if it does over stay its welcome, it goes into the 50% off room in the back. Primrose Cottage is located behind the ABC Store in the Federal Point Shopping Center in Carolina Beach. They are open Monday through Saturday from 10:00 AM to 5:00 PM. The phone number is 910-458-0144. New consignments are taken every day except Saturday. They accept checks, credit and debit cards and, of course, cash is always welcome. 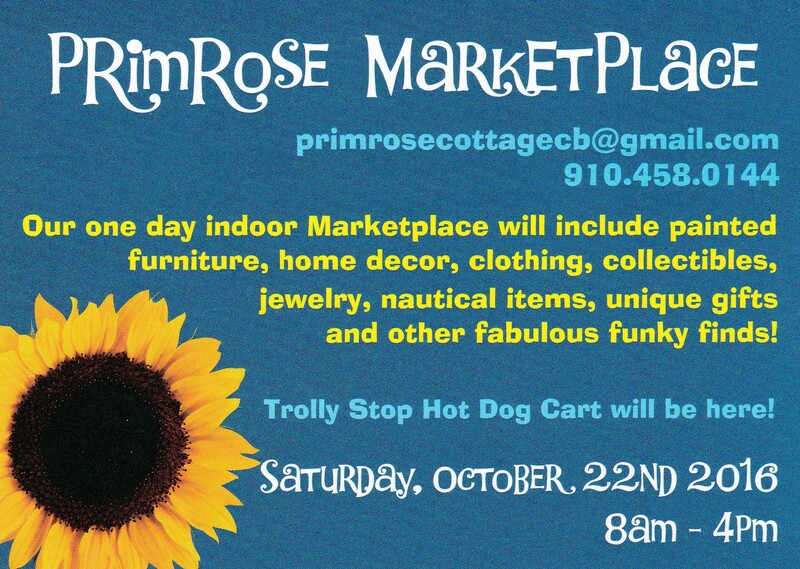 Don’t miss the next Primrose Market Place on Saturday, October 22, from 8 am to 4 pm. In September we lost two long time members of the Society. Our thoughts go out to the the families of past president, Ron Griffin, and to Richard, and the family of Nancy Graham. Welcome to new members Ally Ferreira of Royal Oak, Michigan and Charles Yeager and Bonita McDaniel of Beaver, Pennsylvania. And, last month, I forgot Sandra Shugart’s husband, Wayne, of Winston-Salem. 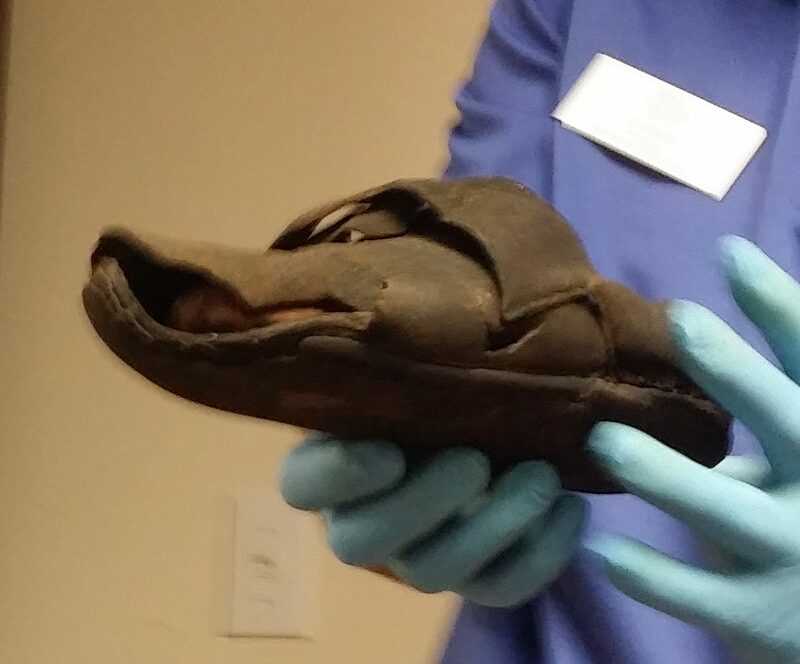 The History Center recorded 167 visitors in August. That is even higher than last month, and now the highest month in our records. 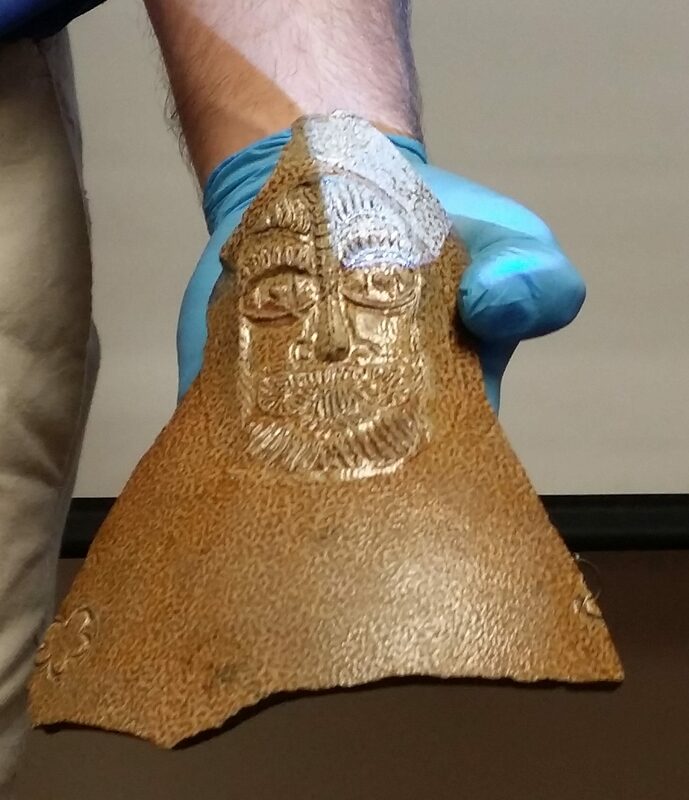 We had 34 in attendance at the August Meeting. The gift shop took in $396.50. The History Center was used by Got-Em-On Live Bait Fishing Club and the UDC this month. Thanks to our active volunteers this month; Darlene Bright, Andre Blouin, Tony Phillips, and Lois Taylor for helping Rebecca with the August newsletter. Thanks to Demetria Sapienza for the refreshments at the September meeting.Thanks to all the Island Day volunteers; Leslie and Darlene Bright, Cheri McNeill, James Kohler, and Cindy Clark. We’re working on enlarging our photo collection. We would love to scan and archive a copy. Lend them to us for a few weeks and we’ll scan them, and give them back to you, and share a digital copy with you, if you want one. We need pictures of buildings, people and events that have taken place in Federal Point from the 1920s to the 1970s.